Posta Rangers and Zoo Kericho have taken command of the race to earn promotion to next season’s Kenyan Premier League, KPL, topping Zones A and B respectively of the national super league. The league is at the halfway stage and all 24 teams in both zones have played eleven matches each. The league is currently on a mid-season break and is expected to resume later this month. Rangers, who missed promotion to the 2014 KPL league at the last hurdle, is top of Zone A with 26 points from eight wins, two draws and a loss. They regrouped this season and have shown intentions of getting back to the top-flight league after relegation in 2012. “We have learnt from our past mistakes that cost us promotion at the death,” Rangers head coach Leonard Saleh told sportsnewsarena.com. Saleh has bolstered his playing unit with three new players ahead of the second leg he says will be a huge test for Rangers. Jared Obwoge has joined from KPL champions Gor Mahia, Moses Odhiambo has been signed from Nairobi City Stars while Alex Libese joins from Moyas. With their current form and team cohesion, Saleh says there is nothing to stop them from making a return to the top league. “Promotion is our sole mission this season. Its achievable because players are determined to go to the next level.” Rangers’ home record has been the biggest advantage as they remain unbeaten but have lost once away. They have won five matches at home against three away. They have banged in 21 goals and conceded eight. FC Talanta is second with 23 points from seven wins, two draws and two losses. They are also unbeaten at home but have lost twice away. FC Talanta have won four matches at home and three away scoring 18 goals and conceding seven times. 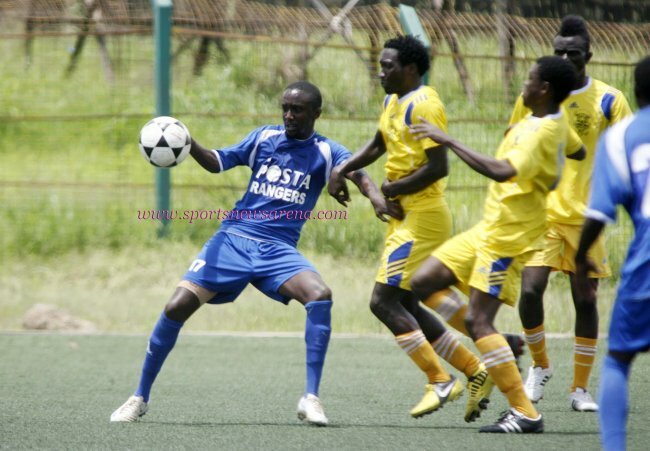 Nakumatt FC completes the top three positions for the zone with only a point behind FC Talanta. It is the only other of the three teams with an unbeaten home record so far. They have won five games at home but lost three matches away, scored 14 goals and conceded 5. Moyas is at the bottom of the table with five points from eleven matches. At home, they have won once and lost five times while their away record accounts for two draws and three losses. Administration Police and Mahakama are tied at eleven points and on eleventh position while the latter has conceded the highest number of goals at 19. Peter Nzuki from Nakumatt FC tops the scorers list with 7 goals. FC Talanta’s duo of Aziz Okaka and Timothy Otieno and the pair of Denis Mukaisi and Fred Ajwang from Rangers are all tied at five goals each. In Zone B, Zoo Kericho has held it tight at the top with 25 points. They have a loss and five wins at home while their away record has three wins, one draw and one loss. Kericho has scored 22 goals and conceded 11. Kakamega Homeboyz, who were relegated from the KPL league last season, come second with 23 points from seven wins, two draws and two losses. They have lost one match each at home and away. Homeboyz has scored 17 goals and conceded 8. At third place is Agrochemicals with 20 points that have come off six wins, two draws and three losses. Their home record stands at three wins, two draws and a loss while away record has three wins and two losses. St Joseph FC, placed fourth with 20 points, is the only team with a home unbeaten record in the zone. Karuturi Sports, eleventh with 3 points, is the only winless team having only earned two draws at home and one away for their points. The team that was relegated from the KPL league in 2013 has soaked in the highest number of goals at 22 while Rift Valley United has scored the least at 4. Finlays’ Joseph Karamoja is the zone’s top scorer with seven goals followed by Juma Cornelius from Shabana FC with six. Daniel Ochieng (West Kenya Sugar), Edmond Murai (Homeboyz) and Masood Juma (Shabana) complete the top three list with four goals each. Full Standings: Zone A-Posta Rangers (26), FC Talanta (23), Nakumatt FC (21), Oserian (17), Ligi Ndogo (14), Nairobi Stima (14), Kariobangi Sharks (14), Bidco United (12), Modern Coast Rangers (12), Mahakama (11), Administration Police (11), Moyas (5); Zone B- Zoo Kericho (25), Kakamega Homeboyz (23), Agrochemicals (20), St Joseph FC (20), West Kenya Sugar (18), Busia United Stars (18), Shabana FC (17), Finlays Horticulture (17), Nzoia United (13), GFC 105 (6), Karuturi Sport (3), Rift Valley United (3).